Bountiful is one of the few new cooking apples that has been developed since the 19th century, having been introduced in the 1980s. 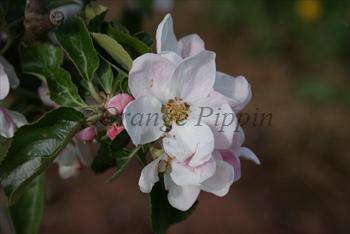 However it has a classic English cooking apple pedigree - it is thought to be descended from Lane's Prince Albert. The fruit size is not quite as large as some of the more traditional varieties, but like all good cookers it is easy to grow and very productive. Bountiful retains its shape when cooked, and is fairly sweet for a cooker. It is a mid-season apple variety, ripening in early September. 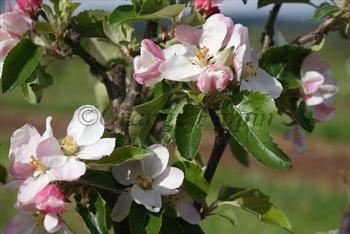 Please fill in the details below and we will let you know when Bountiful apple trees are back in stock. A traditional English early-season cooking apple. Bountiful is in flowering group 2. Bountiful is self-sterile and needs to be pollinated by another tree of a different variety nearby. Bountiful is a good garden apple variety. It crops heavily and has some disease resistance. It is also a good choice if you are not keen on pruning, as its branches and fruiting spurs do not become congested as the tree ages. Introduced by East Malling Research Station in the 1960s. 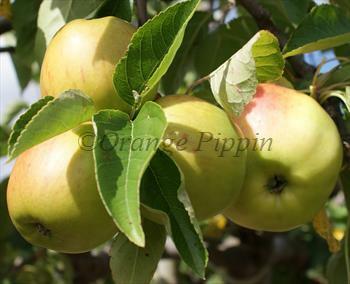 The parentage is possibly Cox's Orange Pippin and Lanes Prince Albert.